Lofty Heights... 'Ohhh Bobby Zamooooora!!! ': The Late Show... AGAIN!!! Rangers Christmas cheer came to an abrubt end as a 94th minute goal from Ebanks-Blake gave Plymouth a Boxing Day derby victory. And yes, the above was indeed written with definite sarcasm. 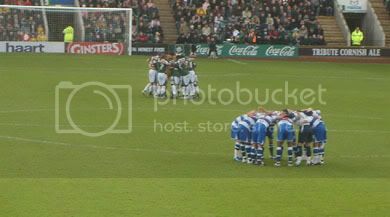 This season's fixtures have become a joke and instead of spending some of the festive period with our loved ones, finishing off the remains of the turkey etc, the FA kindly sent us down to Home Park - one of the furthest away trips of the season. This made even more annoying when reading the programme, saw that Plymouth played Bristol City just last week and the R's travel to Watford next Saturday! Come on Lord Mawhinney, it's not bloody difficult!! So, with the above in mind, we set of at 9.30 for the mammoth trip to Devon, at which point, I must just mention that the journey started for the Leeds contingent at 7pm Christmas night - who lodged at mine and as I am writing, are on their way back to Yorkshire right now! Even after the long journey, it was a surprise to see keeper Lee Camp make an appearance in the away concourse, obviously caught short before the warm up as he headed straight to the toilet. Obviously, photo opportunities were not taken at this point. Onto the game, and Rangers were dealing well with Argyle's hoof ball in the first half and were ahead on 19 minutes, as Martin Rowlands cut the ball across for Gaz Ainsworth to slide the ball home. 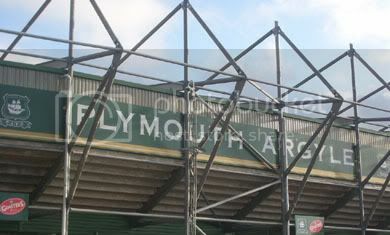 Despite having the majority of the possesion, Rangers continued to deal comfortably with whatever Plymouth offered and went in deservedly a goal to the good. Now, not for the first time, it seemed a different R's side that came out for the second half. It was obvious that Argyle were going to be up for it, but Rangers were now struggling to deal with what they had dealt with so comfortably previously. Three minutes after the interval, Argyle were level when Walton (perhaps a bit harshly after seeing the TV replay) was adjudged to have handled in the area and Ebanks-Blake made no mistake from the resulting spot kick. The referee then took centre stage and started handing out yellow cards like Christmas presents - in a game that in truth, didn't really have one dirty tackle in it. But, just as we thought we may hold on for a well earned and decent point, disaster struck in the 94th minute. Halmosi's corner caused panic in the R's box and, after the ball eventually bounced down off the bar, Ebanks-Blake was on hand to smash home a late, late winner to break our hearts, ruin our Christmas and make the journey home an extremely long one. QPR: Camp, Barker, Bolder, Buzsaky (Blackstock, 78), Ainsworth, Rowlands (Nygaard, 67), Walton, Malcolm, Vine, Rehman, Leigertwood. Subs: Cole, Moore, Kanyuka. whoops spoke too soon . so here we are back in the relegations zone . I hoped this season would end with us getting tantalizingly close to the play offs , but I would be happy now to stay in this division . What do you think is wrong with our second half tactics ?. Come on the Hoops , thanks Lofty . I can only presume about the second half stuff is that this maybe an 'Italian' thing - rather than go and try to kill a game off, we try and protect what we have. Lee Camp's performaces have saved other defeats without a doubt. Palace at home was a classic example - 1-0 up and cruising at half time, we lose the game 2-1. The Rs highlight of the week for me was the story in the Telegraph when a young QPR fan said his dream for January was buying Lee Cook back. Absolutely precious and I hope that our new found finances never change that kind of love for the team and players. I'm looking forward to changes in the new year, to getting (and staying) out of the bottom three and the Rs winning a couple of games in the last few minutes.